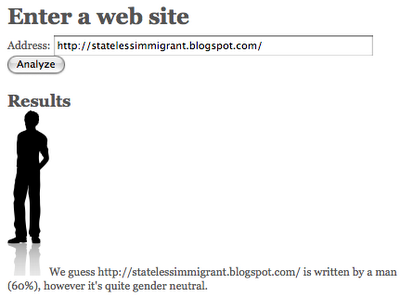 Stateless Immigrant: Who is writing my blog? Who is writing my blog? Some guy, according to Gender Analyzer. Edit 22-Nov-08, 0:58: My rant about 10 things I don't understand about cars seems to have triggered some male words ("truck" or "hell"?) and made the Analyzer show 64% male... I wonder if a mentioning Blahniks will make a difference? Edit 22-Nov-08, 1:03: Oh yes it did. Cost me a whole percentage point, too. I tried it on my blog - http://jimsgarage.wordpress.com - and guess what? @jplgsx: It's because of the repeated use of the word "shoe(s)" I bet! Women like shoes--and who cares that footwear is kinda critical for driving! In case there was any doubt... I am such a geek! I can haz speeeeeed plz?